RasterWeb! Now you can Like it! Now you can Like it! But here at RasterWeb! World HQ we see the value in ‘Liking’ something. Sometimes you like something but you don’t feel like leaving a comment. Even if it’s a one word comment like ‘Cool!’ or something. It just seems like too much work! So now, thanks to the i like this plugin for WordPress, you can simply click the little plus sign to let people know you like a post here. That’s it. But wait, why didn’t I use the Facebook ‘Like’ button? Because the only reason to do that is to more widely spread the ‘Like’ info into the Facebook universe, and while we haven’t quit Facebook (but salute those of you who have) we decided that there’s more value in making the ‘Like’ function exist completely outside the walled garden of Facebook. Yes, the web exists as a great interconnected network, and can go on existing without a central controlling point. In face, we’ll all be better off if that is the case. Of this I am sure. So with that said, if you like this post, use that new ‘Like’ feature! 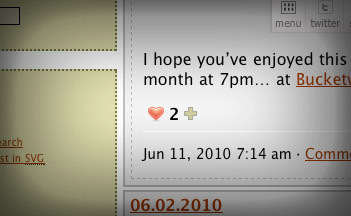 Posted on Tuesday, June 15th, 2010 at 6:31 am. Subscribe to the comments feed. Both comments and pings are currently closed. Post on your own blog. But what does it do other than just increment a counter on this one site? Does it share that like/recommendation information with any outside sources? Part of the “appeal” of the Facebook Like button is that it posts a link to your Facebook profile, giving visibility to whatever content it is somewhere else on the web. I don’t see any sort of functionality like that with this version. Am I missing something? Is it possible to make the heart clickable? Just a question of usability. The green + blends in with the background. Now I know what I need! I need a button on my blog labeled “meh” for people to express themselves with! I lied on facebook about not liking this post. Hey, I ‘liked’ it in Google Reader too!